I bought some raw chestnuts on a whim the other day. I couldn't resist filling a small bag with them at my local grocery store, since they were on sale. 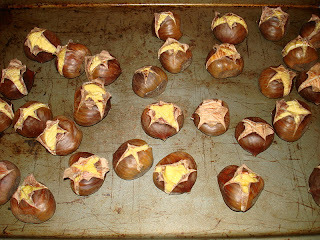 Many people don't like chestnuts, but I love them and sometimes buy them already roasted and peeled, but it's not the same. They remind me of my year in Paris, where street vendors would sell them hot from the fire in little paper bags. Since no one in my neighbourhood sells them on the street corner, I decided to give it a try myself. Ready to peel and eat! The process itself is quite simple, and the results were delicious! 1- Preheat oven to 425F. 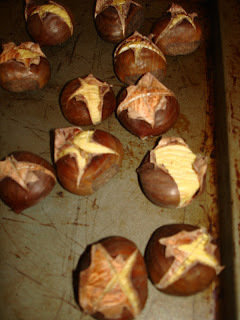 2- Cut an X into each chestnut, piercing through the skin. This allows steam to escape, preventing the chestnuts from exploding in your oven. It also makes peeling easy. 3- Lay the chestnuts on a baking sheet in a single layer, X side facing up. Roast for 20-30 minutes. When the X has split open and curled back and the inside has a light brown colour, they're done. 4- Remove from oven and peel as soon as they're cool enough to handle. 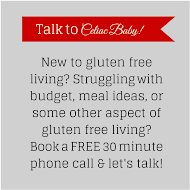 They're yummy eaten on their own as a snack, or crumbled into soups and salads. They add extra flavour to recipes with turkey, and can be crumbled into pie crusts. As a dessert, they're excellent dipped in chocolate, or prepared "marrons glaçés" style, dipped in a liquid sugar mixture that leaves them looking crystallized. Delicious!